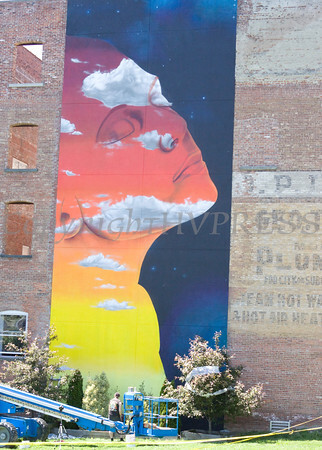 Dasic Fernandez, an artist from Chile, created a four-story-tall mural entitled "Transcendence," on the façade of Safe Harbors of the Hudson and The Ritz Theater in Newburgh, NY on Saturday, May 12, 2012. Dasic Fernandez, an artist from Chile, created a four-story-tall mural entitled "Transcendence," on the façade of Safe Harbors of the Hudson and The Ritz Theater in Newburgh, NY on Saturday, May 12, 2012. Hudson Valley Press/CHUCK STEWART, JR.